Capelli Foods recently did the catering for the National Music Muster in the Amamoor State Forest just out of Gympie, Queensland. 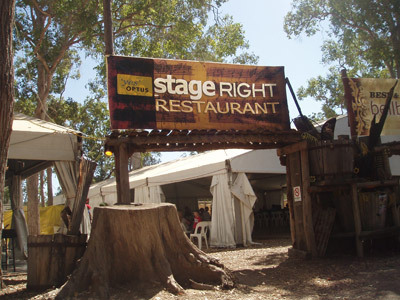 In the hot August heat we packed up trailers, trucks and cars and set up camp at Stage Right, a 250 seat Al la carte restaurant. With help from our amazing waiting staff, five chefs, hospitality students from Gympie High and many volunteers from the local community group, Friends of Kandanga, we served 1691 meals which included 555 steaks! Michael’s Muster Chef classes were an overwhelming success – over 150 people came to watch Michael show off his culinary skills. He demonstrated how to cook the perfect steak and different ways of marinating and cooking fish. Thank you to all of the wonderful volunteers (Puddy and Carol, especially) for tirelessly washing the tea towels, clearing and washing the dishes. The Muster was a hectic but fun week and a great chance for us at Capelli Foods catering to cook for some friendly faces. For catering on the Sunshine Coast, please contact us.